'Course, a signed Nylander has a higher trade value than an unsigned Nylander. Lol, just messing with you OBXer. Although, if word does come out that the Leafs signed him to a "league-valued" contract rather than a "Leafs discount" contract, I'll be keeping my eyes peeled for a possible subsequent trade (not necessarily to us). At some point, the Leafs might just get tired of the situation and move on if they get a decent enough return. Fleury and Necas down Bishop up? Im surprised Bishop is the one that gets the call. I thought McKegg would have been it. not surprised in the slightest that Necas was sent down. I'm just trying to do the math. 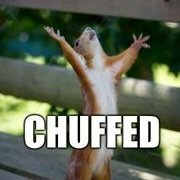 Three down (including PDG) and only one back. That leaves two open spots? Help me out here peeps. 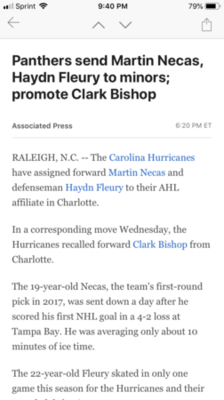 It's a shame this happens right after he scores his first NHL goal, but it's no secret that Necas has been struggling. Svech hasn't been perfect either, but at least he's produced and looked really good at times. I've got a feeling that this ends up being a permanent move this season, with Bishop (or perhaps someone else, barring him struggling, too) filling the gap until the time Rask is ready to come back. A year in the AHL will do Necas good as he adapts to the physicality that is expected in this league. I don't think Fleury being sent down is necessarily an indictment on him, but rather a sign they don't envision sitting TVR in the short-term, and simply want Fluery to see some game action. Don't expect to see him away from the Canes for too long. Well, we know it's not Rask. Darling a very good possibility. Trade: ??? I thought maybe it would maybe be Nic Roy that came up. Big, physical kid who is off to a hot start in Charlotte (4 goals and 2 assists in 4 games). edit: here's what Michael Smith said about Darling in his tweetmail just 2 hours ago: "He's still likely a week or two from being set to return - rejoining the team at practice is the next step, and then there's the possibility of a conditioning stint in the AHL - but Darling is moving in the right direction." Which comes to 21 players. Someone had suggested that perhaps they're about to activate Darling, which would make it 22. If it were a trade, we wouldn't have sent down Fluery (assuming we'd be trading away a defensemen, and not gaining one back). Unless, of course, we are trading McBackup for 2 additional players (unlikely) or trading a forward for 2 additional players (even more unlikely). Unless I'm mistaken, Rask already counts towards the roster, doesn't he? On the Canes roster list, they don't have him designated as *IR. Unless I'm missing something. edit: here's what Michael Smith said about Darling in his tweetmail just 2 hours ago: "He's still likely a week or two from being set to return - rejoining the team at practice is the next step, and then there's the possibility of a conditioning stint in the A﻿HL - but Darling is moving in the right direction." Yeah, I read that, but I figured that's just more Michael's opinion, and not based on the team's official word. I guess it's also a possibility that they're only sending Fluery down to Charlotte to play in their home game on Friday and are going to recall him back on Saturday. I dunno. Fleury needs the ice time. He isn't going to progress making sandwiches in the presser. Necas needs some seasoning. Darling is probably close. These moves aren't surprising, but it's a new way of doing business for the Canes. edit: It does however ramp up the need to figure out a 3C since Necas was counted on and Rask amputated his hand. It’s because of the golf club incident at Top Golf Tampa. At this point, it's Wallmark. That entire line has been playing more like a 3rd, rather than a 4th, anyway. Leafs are meeting today with Nylander and his agent in Switzerland. Now who can we get from the Blackhawks for Faulk? Nobody, apparently. We tried before his NTC kicked in. Wallmark has really impressed me. Aside from Staal, this guy is always finishing he checks. Not sure anyone has noticed it but I have. Martinook too. Was not feeling this line on paper... love it on the ice. I yet I changed it 2 minutes after I posted it because I knew I might not be clear enough that Leafs would be faced with another contract negotiation next season. Okay, but your post (still) says he will be a free agent "next season." Three times, per the below, quoted from the post on the page right now. And that is factually incorrect. If/when Faulk goes somewhere, nobody needs to re-sign him before Jun 30, 2020. Why you don't want Faulk 1) He will be a free agent next season 2) He will be a free agent next season and you will need to fit him in your cap plan 3) With your high scoring forward crew you don't need a big shot, offensive minded Dman 5) Did I say you would need to re-sign him next year while you have two other Dmen you also need to resign. They actually have video of Necas throwing the golf club at Brindy at TopGolf. Fleury needs the ice time. It does however ramp up the need to figure out a 3C since Necas was counted on and Rask amputated his hand. No question about it, re Fleury. I think Bishop's call-up is really interesting and highly strategic. It basically acknowledges that Wallmark's group has earned third-line status, in the present roster. Martinook and Svech can certainly score the puck, and if you put Bishop with Zyke and McGinn on the fourth, it keeps Zyke on the D-first treadmill, and maybe he and Bishop find some offensive chemistry from playing together in CLT. But Bishop also has the NHL games to burn. So now I'm really wondering if a deal is in the works. A fourth centered by Bishop feels like a place holder for Wallmark's line. They could have called up Roy or Kouk to try on the third. But Bishop plays heavy and grinds; Roy and Kouk project to scoring lines. And while Wallmark's line is solid, in a perfect world it's the fourth, and your third is what we hoped ours could be if Necas caught fire. If a deal gets done quickly, Bishop goes back to CLT, Wallmark's line returns to fourth, and Roy, Kouk and Bishop can lead CLT deep into the playoffs. The reasoning for sending down Necas (more seasoning) and Fleury (to give more playing time, confirmed by Mike Smith in his Tweetmail) makes sense. Fleury needs to play for sure. Of course I think he needs to play in the NHL, so Faulk has to go. Until then, he simmer in Charlotte. I guess he can work on his offensive game. Necas was a bold move IMO. If the committee thinks you're not ready, you're going down, you can find your game in Charlotte. I'd have given him a few more games, but this was coming. I think Wallark's play in part allows for this too. As mentioned, he is the de facto third line center now. Bishop is being brought up because he's a more prototypical 4th line center and also because we want our top 9 centers on scoring lines in the AHL rather than the 4th line here, hence Roy and Kuok, two better players than Bishop staying put. And I agree, if Bishop is a beast at killing penalties, then we both need it and need to send that message. IMO as Top mentioned though, moving Necas down (and for me Fleury too) increases the chance of a trade of D for center. And I agree, if Bishop is a beast at killing penalties, then we both need it and need to send that message. It was only a couple games and against AHL competition, but his play on the PK got my attention sure enough. If he can approach that in the NHL, he can only help the Canes' PK. I think PP is close.a few more tweaks ...a puck that bounces right... we are in business maybe.?. pucks are always cantankerous in the southern buildings when it’s 90 outside. Disgusting weather, whether there’s a hockey game or not. Yeah, everybody likes to say it affects both teams equally, but when you're the home team and haven't played anywhere else you're a lot more used to it than a visitor that just played in the Great White North (eh?). All night in Tampa, it looked like the Canes were playing as fast as they did in the Peg, but the puck couldn't keep up. Disgusting weather﻿, whether there’s a hockey game or not. ??? Are you from the North Pole? We call this "Beach Weather".